Do You Suffer From Ringing In Your Ears? Tinnitus can have a significant effect on your life if you chronically suffer from it. Take the necessary steps to stop struggling with tinnitus today! If you are searching for the most qualified and caring audiologist for yourself or your loved one, you are in the right place at A&E Audiology & Hearing Aid Center of Pennsylvania! You should feel confident when choosing your Lititz, Willow Street or Lancaster, PA, audiologist for yourself or your family. 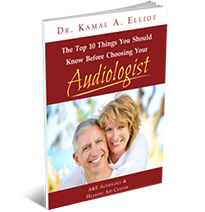 To help you make an informed decision, Dr. Kamal Elliot has written this free report: "The Top Ten Things You Should Know Before Choosing Your Audiologist. What Is It? Why Do You Have It & What Are Your Treatment Options? Tinnitus is defined as a sensation of sound in your ears or sometimes in your head. In some people, the sound can cause depression or anxiety, and it can interfere with concentration. 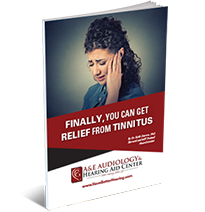 Get the information you need about tinnitus from this free report by Dr. Kamal Elliot. Why IS A&E Audiology & Hearing Aid Center Different? We are proud to be able to provide state-of-the-art NeuroTechnology™ as part of your hearing rehabilitation, so you can enjoy true hearing clarity. NeuroTechnology™ addresses the critical link between the sounds received by your ears and your brain’s ability to process those sounds efficiently and correctly. Our team has helped over 16,000 happy patients get back to living their lives with improved hearing since 2001. Your hearing health is important to us, and our audiologists are passionate about helping as many people as possible to restore clarity to their sound experience, including you! We take our responsibility to you and your healthy hearing very seriously. We work diligently to stay on top of current trends and new innovations in audiology. We also strive to maintain a relaxing and welcoming atmosphere in our hearing center locations. Our core purpose is to ensure your comfort and happiness from the moment you walk through our doors. When you arrive for your initial hearing consultation at our hearing center, we don’t believe you should have to schedule yet another appointment before you can actually start treatment. After all, the sooner you start, the sooner you can enjoy the sounds of the world around you with improved clarity and understanding! You read that correctly! Our hearing center treatments come with a complete money-back guarantee on your service and prescription programming. If at any time you feel less than 100% satisfied with the care and service we provide you for your hearing needs, let us know. We will do what it takes to make you happy, and we will give you a full refund if we can’t. Technologically advanced hearing aids are an investment for better hearing health and improved cognitive ability. At Intermountain Audiology, we want to make it easy for you to have access to high quality hearing aid solutions without your treatment being overly burdensome to your finances. Schedule Your FREE Hearing Consultation For Tinnitus Today! Meet The Founder Dr. Kamal Elliot, Au.D. Meet Dr. Jason Schmitt, Au.D. Meet Dr. Jeff Seevers, Au.D.